In 1912, Mies established his own office in Berlin. Through furniture, residential projects and extraordinary, yet unrealized concepts for skyscrapers, he gained recognition as a leader of the German modern movement. As such, he was selected to design the German Pavilion at the Barcelona Industrial Exposition of 1929. His design, a rhythmic arrangement of horizontal and vertical planes of glass, stone and metal was an experiment in free flowing space. With no discernable distinction between rooms or inside and outside, the design fundamentally challenged the architectural ‘boxes within a box’ standard of the time. Inside, Mies included the Barcelona Chair and Ottoman, designed to offer the King and Queen of Spain to a place to rest (they in fact never sat down). The Barcelona Pavilion and the chairs it contained are universally recognized as milestones of modern design. 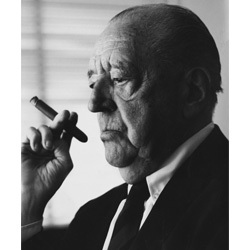 Mies served as Vice President of the Deutsher Werkbund and Director of the Bauhaus from 1930 until it closed in 1933. He immigrated to the United States in 1938 to become the director of architecture at the Armour Institute (later the Illinois Institute of Technology). From his Chicago-based practice, Mies designed a portfolio of buildings that changed the face of American institutional architecture ― the most notable examples being the IIT campus and the Seagram Building in New York. While at IIT he befriended and mentored a young Florence Knoll. Florence has always credited Mies as her most influential instructor, and, in 1948, Mies granted Knoll exclusive rights to produce his furniture, including the Barcelona collection, the Brno chair, and MR series.